During reconstruction of the railroad crossing near Old Apex Road, Cary Parkway will be closed for several weeks starting July 14. The upgrade will include sidewalk construction across the tracks and new pedestrian signals. “We worked hard to find a way to complete this work without having to entirely close Cary Parkway in both directions for this project, but after consulting with both NCDOT Rail Division and CSX, instituting a full closure was necessary in order to be time sensitive and cost effective,” said Bob Shultes, a Town of Cary transportation engineer. During construction, through traffic traveling on Cary Parkway will be detoured down to Highway 64 and back – adding 2.6 miles of trip distance, as well as numerous traffic signals. 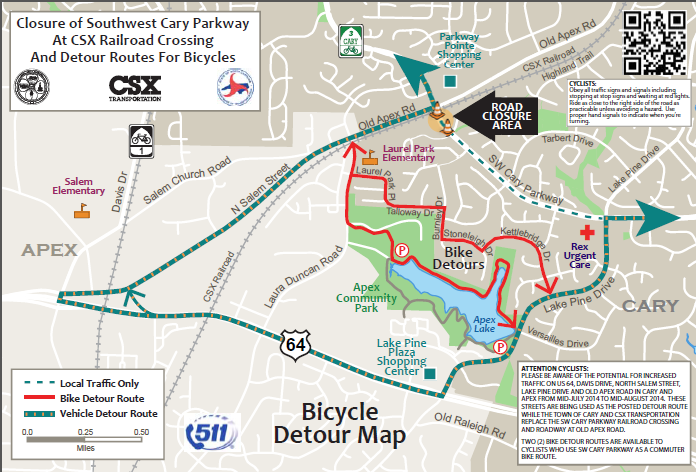 Because bicyclists are especially sensitive to increases in trip distances, however, Cary published a special detour map for bicyclists showing a shorter detour through local residential streets. The residential detour saves at least 1.2 miles compared to the general traffic detour, and features roads that are generally more pleasant for cycling than Highway 64. Channeling thousands of cars per day onto local residential streets would be extremely disruptive to neighborhood residents, and those streets are not designed for such volumes of motor traffic. A light volume of bicycle traffic, however, is much more compatible with residential streets, and such streets are often preferred by local utility cyclists. This is the principle behind bicycle boulevards, which seek to provide through routes on local streets that have traffic diversions that are permeable to through bicyclists, but not motor vehicles.